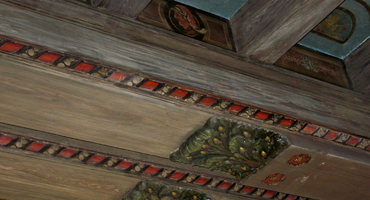 IFACS offers services that range from consultancy, conservation and restoration of historic interiors to contemporary design schemes and decorating. 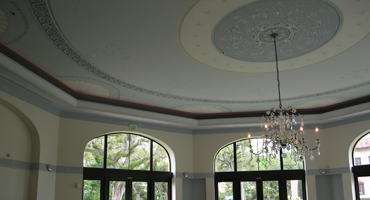 IFACS specializes in the execution of fine finishes for both historic and contemporary interiors. For our work in the El Jardin building, Ifacs won the esteemed Shutze award for the ceiling of the new library. New Library Building – interior and exterior decoration. Trompe L’Oeil Adamesque ceiling to the Library Reading Room. 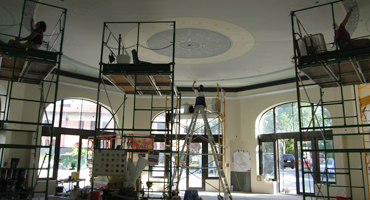 IFACS will bring its extensive experience in restoration, conservation and preservation of historic buildings, interiors and fine arts to the service of your historic project. Our highly qualified and experienced specialist artists and craftsmen employ the most respected and knowledgeable techniques. IFACS talented artists and craftsmen will transform your home or commercial property using tasteful and exquisite original fine finishes, decorative techniques and materials and drawing on our extensive experience of contemporary projects of all sizes. IFACS consultants will meet your consultation needs drawing on detailed knowledge and appreciation of historic building, years of experience and cutting edge diagnostic tools and techniques. ©2019 International Fine Art Conservation Studios, Inc. All Rights Reserved.